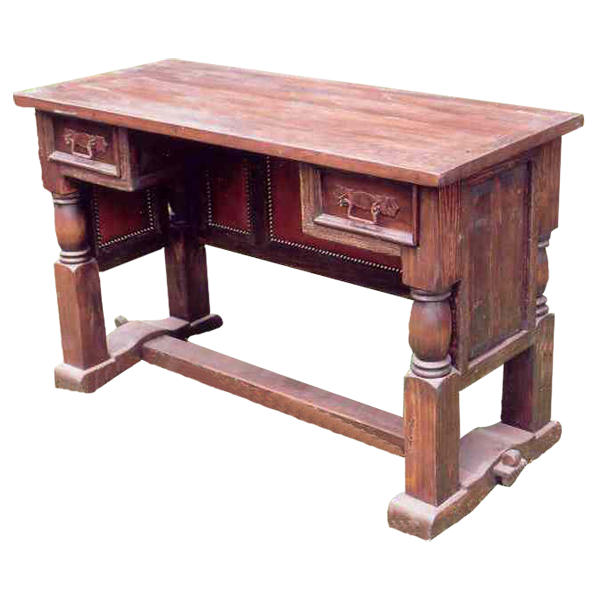 This handcrafted, Western style console is as beautiful on the inside as it is on the outside. The console has inside rectangular cut panels, and each panel is covered with rich, brown, full grain leather. The leather is hand tacked to the solid wood frame with ornate, gilt nails. The console has an open, wide top with a classic, straight rim. Below the top rim are two, rectangular drawers, and each drawer has on its face a hand forged, iron handle. Each lateral side of the console has a decorative, rectangular cut panel. The upper legs are hand turned, and the legs end in a square cut design. Each pair of legs rest on a solid wood base, and each base is connected with a sturdy crossbar. The console is made with the best, sustainable, solid wood available, and it is 100% customizable.